Yesterday I walked from Glendale, Arizona to Peoria, Arizona. They are two suburbs of Phoenix that originally were five miles apart. So, if you know the Phoenix area, and you know a little bit about its history, you would have been impressed if I told you that I walked from one little town to another 100 years ago. Yesterday, you wouldn't have been impressed, because the two cities meet in the center of 67th Avenue. That is, when you walk across 67th Avenue, you start in Glendale, and when you get halfway you're in Peoria. I've lived in Glendale for a long time, and I've even seen the Peoria police cars turn left, while the Glendale police cars turn right. But make no mistake, if needs be, the two cities help each other out. It isn't as if the Glendale police would chase you to the city limits and stop! When I lived in Los Angeles, it was a crazy patchwork of little towns that had grown together. Just a few decades before I lived there there were open spaces between the towns, but since those spaces have been gone for so long it's hard to say the moment when you leave Van Nuys and enter Canoga Park, for example. In fact, when I lived there I heard someone say that it was very convenient that the city of Los Angeles had divided itself up like that! I guess if you don't know the history, it looks like that. Anyway, that's what happens with big cities, the towns that once were miles away grow to each other and touch. If I tried to walk from downtown Glendale, which is at 59th Avenue and Glendale, to downtown Peoria, which is at 83rd Avenue and Peoria, my little weak ankles wouldn't never make it. But going from the Glendale City Limits to the Peoria City Limits now just means crossing a street. Nothing much changes as I cross the street. My phone tells me that I'm no longer in Glendale, and I'm told that the city sales tax is different (I don't pay attention to that kind of stuff!). 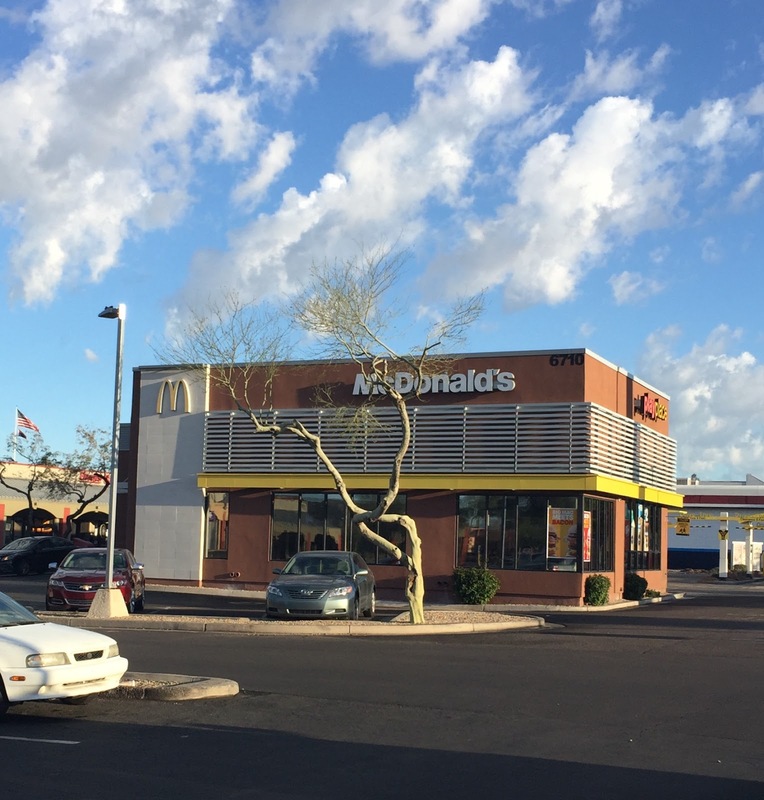 There's a "Welcome to Peoria" sign that I walk past on my way to get my coffee at McDonald's, but otherwise Peoria looks just like Glendale. But I get to say that I walked from one city to another, just to get my coffee in the morning! Image at the top of this post: McDonald's in Peoria, Arizona. You can see Glendale if you look out the window, looking east.